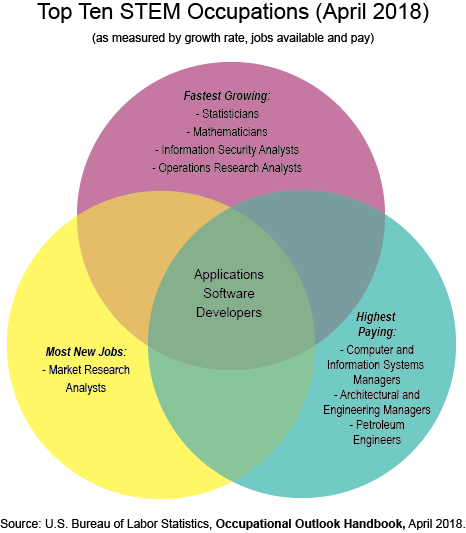 Applications software developers are a hot commodity in the current job market. That’s according to the April 2018 Occupational Outlook Handbook, published by the U.S. Bureau of Labor Statistics. You interact with the work of applications software developers every day if you use a computer, cell phone, tablet, video gamer system or e-readers. They are the creative minds who make possible the games, word processors, social media, shopping and other apps and software you use on your mobile devices or computers. “If you’re working in a STEM field or looking to make a career change, being an applications software developer is pretty lucrative right now,” said Don Johnson, ORAU senior economist for workforce studies. App software developers are among the fastest growing science, technology, engineering and mathematics careers in the country. They are also among the highest paid STEM workers, and have the most available jobs than almost any other career choice. The U.S. Bureau of Labor Statistics classifies this as a bright outlook occupation, which means they predict employment will grow much faster than the average for all occupations through 2024. If you have questions about ORAU's Workforce Solutions capabilities, contact 865.576.3424 or science.education@orau.org.